On his latest EP, Aphex Twin abruptly pulls the rug from under your feet, turning his nostalgic IDM perspective into an etude on electronic music deconstruction. Every time Richard D. James, aka Aphex Twin, is about to release a new record it feels as if the music world is holding its breath. Awaiting one of the pioneering figures of IDM to produce new work has become an exercise in patience, as was the case with the 13-year wait following the release of Drukqs, but it is was always worth the wait. The feeling is similar with the extended plays from Aphex Twin, which always explore different topics. His 2016 EP Cheetah for instance saw the producer undergo an interesting investigation of one of the most complex digital instruments in existence in the digital synthesizer Cheetah, resulting in a retro work with impressive textures. In any case, whatever the topic or the situation may be, every time James is releasing new music he makes a point of not repeating his past self. In his new work, Collapse, it initially feels that this promise of striving forward might have come to an end. The opening track of the record features as trademark an Aphex Twin sound as you can have. The subtle melodies over the polyrhythmic foundation are fantastic, but you constantly get the sensation that you have heard these before, that they are part of a territory that has already been explored. The same quality is awakened in the final part of "MT1 t29r", with this oneiric characteristic bringing forth a serene perspective from the melodies, highlighting the mesmerizing effect of the record. However, that is just a trick and Collapse dives much deeper. Midway in the opening track "T69 Collapse", the upbeat Syro-esque rendition abruptly ends in a sudden drop from reality. High pitched synths come in to drench the soundscapes in a state of disarray as if the alarm for an impending nuclear catastrophe has gone off. It is a daunting moment, and one of the darkest and more sinister parts James has conjured in his long career. The mechanical sounds appear to be lost in some impossible calculation, eagerly beeping on the background trying to come to some resolution, but miserably failing. Similar is the case with the start of "MT1 t29r", which carries on this exploration of a dystopian, collapsed world. It is in equal parts the dissonance of the sounds and their cacophonous touch, arriving as sirens and beautifully presented in "1st 44", but also the state of the synthetic percussion. From the polyrhythmic renditions, James forms disfigured time placements that arrive in an unpredictable manner. These appear to be almost devoid of energy, just randomly popping on the soundscapes and adding the dying pulse to the textures unleashed by the synths. The need of fluency and fluidity to structure this work is obviously non-trivial, but that is what Aphex Twin has been excelling at for his entire career. Switching between the light, IDM parts in Collapse to the disruptive, dystopian soundscapes is performed in a brilliant fashion. The two modes become interchangeable and further permutations are also visited. While verbose in his minimalism for most of the record, tracks like "1st 44" see James switch from this never-ending plethora of synthesizers and beats to a stripped down version of the track. That allows a different texture to enter the sonic palette, as is the case with "abundance10edit[2 R8's, FZ20m & a 909]", which sees a tribal characteristic come forth and provide a further mystical layer to the mesmerizing side of this work. 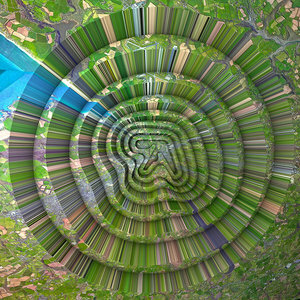 In the end, this album feels just as another reminder to never sleep on Aphex Twin. With Collapse, James produces a surprising work of dark deconstruction, interchanging the Syro sound with a range of dissonant ideas and disfigured rhythmic patterns. It is all that remains in the debris, on the aftermath of this collapse.